RICHMOND, VA (April 8, 2019) – In recognition of the 20th running of the Ukrop’s Monument Avenue 10k presented by Kroger on April 13, Delegate Dawn Adams introduced House Resolution 350, which passed the Virginia House of Delegates and commends the 20th anniversary of the community event. The history of the 10k will now be archived and become part of Virginia’s written history. 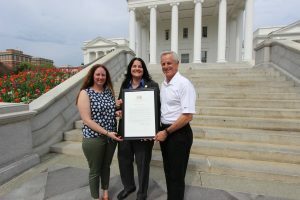 In a ceremony held on the steps of the State Capitol, Delegate Adams presented an official framed copy of the resolution to Meghan Keogh, event director for the Ukrop’s Monument Avenue 10k, and Bobby Ukrop, President of Ukrop’s Homestyle Foods. Ukrop’s has been the title sponsor of the event since its creation in 2000. In addition to support from Delegate Adams, other House patrons of the resolution included Delegates Bagby, Carr, Convirs-Fowler, Delaney, Heretick, Hope, Kory, Rodman, and Ware. Registration for the Ukrop’s Monument Avenue 10k presented by Kroger and Virginia529 Kids Run is still open and available at www.sportsbackers.org. The TowneBank Health and Fitness Expo at the Arthur Ashe Center kicks off the event from 3:00pm-9:00pm on Thursday, April 11, and from 11:00am-9:00pm on Friday, April 12. The Kids Run starts at 8:00am on April 13, followed by the 10k at 8:30am. The full schedule of events is available here: https://www.sportsbackers.org/events/monument-ave-10k/10k-schedule/.